Founder in 1665. Privately owned and restored in 1996. Managed by Starwood Hotels & Resorts in 2001. Mr. David Nava – With more than 25 year of experience, David Nava general manager of Hacienda Temozon is always looking to deliver a unique, local and exceptional experience to all our guests. One of his top priorities is to take care of the local community as well as his employees. AAA Four Diamonds. Luxury brands : Virtuoso, AMEX Fine Hotels and Resorts, Starwood Luxury Privileges. Known since 1665 as the estancia of Diego de Mendoza, a descendent of the conquistador Francisco de Montejo, Hacienda Temozón produced livestock and maize. During the second half of the 19th century it was transformed into a sisal hacienda by its owner Carlos Peón Machado. 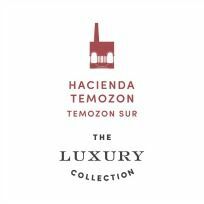 One of the most important in the peninsula, with an area of 6642 hectares, 640 workers and the most powerful industrial equipment in the region, Temozón is one of the best examples of the prosperity generated by sisal production. However, after the First World War, the consumption and price of these tough fibers dropped violently when nylon was invented, making the upkeep of these huge complexes untenable. 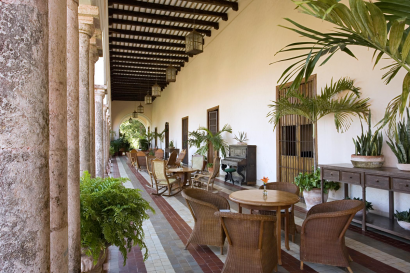 After passing through various hands, it was acquired in 1996 by a private group, Grupo Plan, who immediately set about the restoration and adaptation of its buildings and 37 hectares of gardens. 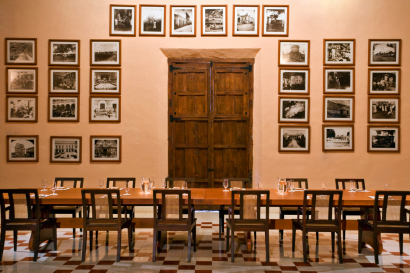 The Hacienda was fully restored after it´s acquisition by Grupo Plan in 1996, by architect Luis Bosoms Creixell. 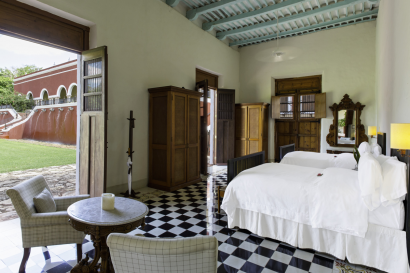 A former sisal Hacienda of the 17th Century with 28 rooms, built of coral walls and white moldings in the tropical rainforest ambience of the Yucatan peninsula. 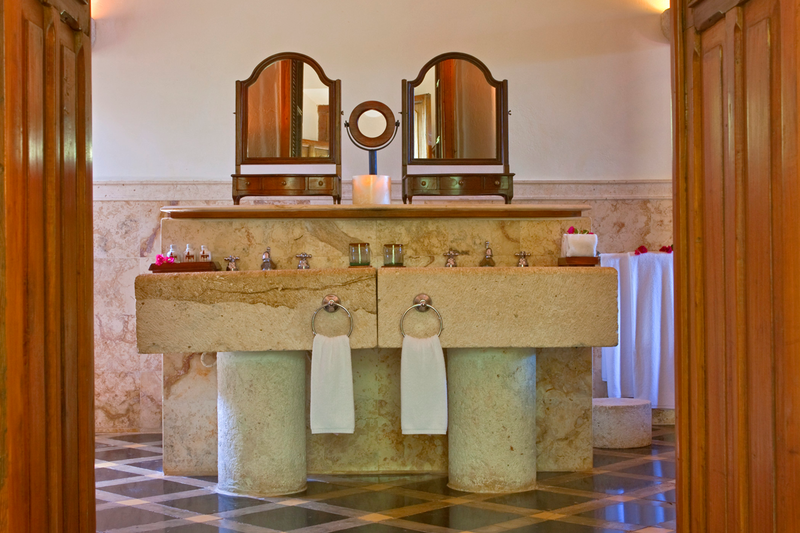 Restoration was made respecting all original molds of the property, which offers an experience completely unique and authentic. 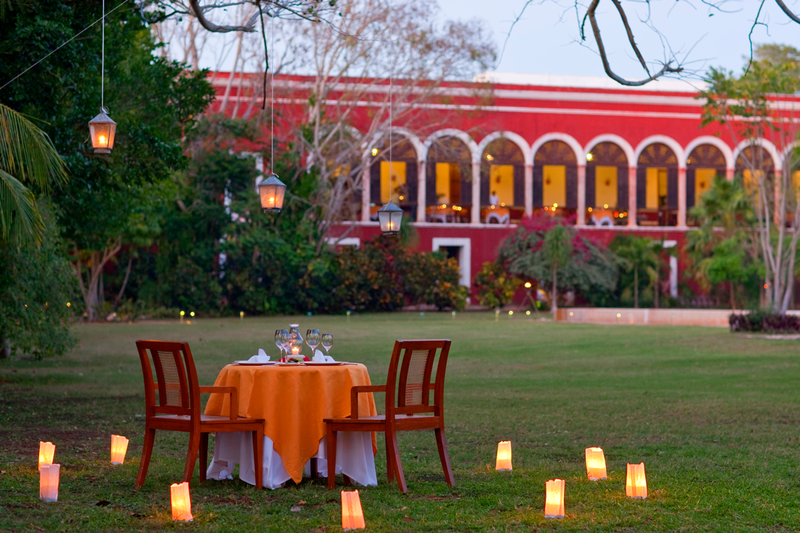 Located 45 minutes from Merida´s City, 30 minutes from Uxmal Ajouter au dictionnaire site. According to the Maya belief Aluxes (mythical beings of the Yucatan peninsula similar to elves or goblins) guard all of our lands. People of the Hacienda say that Aluxes go out at night leaving their hideouts and walking around the fields. They go up and down, throwing rocks, being naughty, stealing the fire and annoying people with their steps and games. When humans wake up and try to get out and see what it’s all about, the aluxes run away. Aluxes are not evil things, they are mischievous but if you give them an offering and treat them well they´ll drive away evil winds and chase off pests. 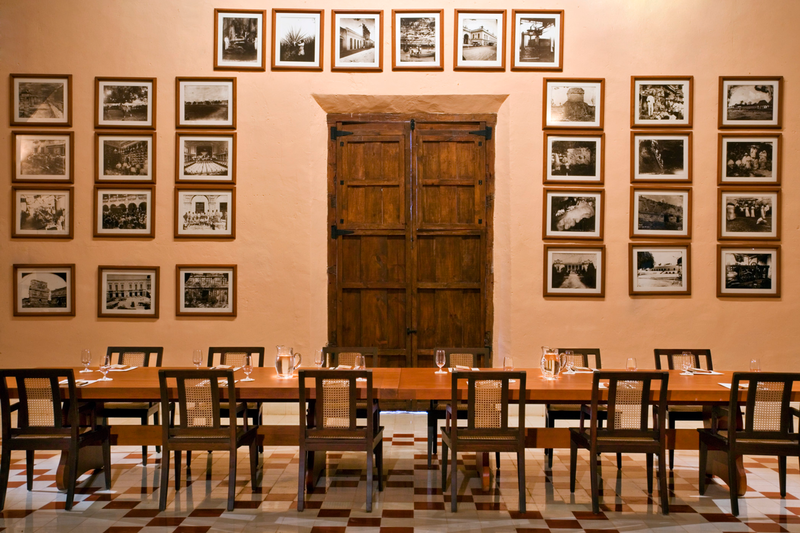 People usyally give offerings around the Hacienda such as pozole (corn dough) and cigars, which is believed to be their favourites. 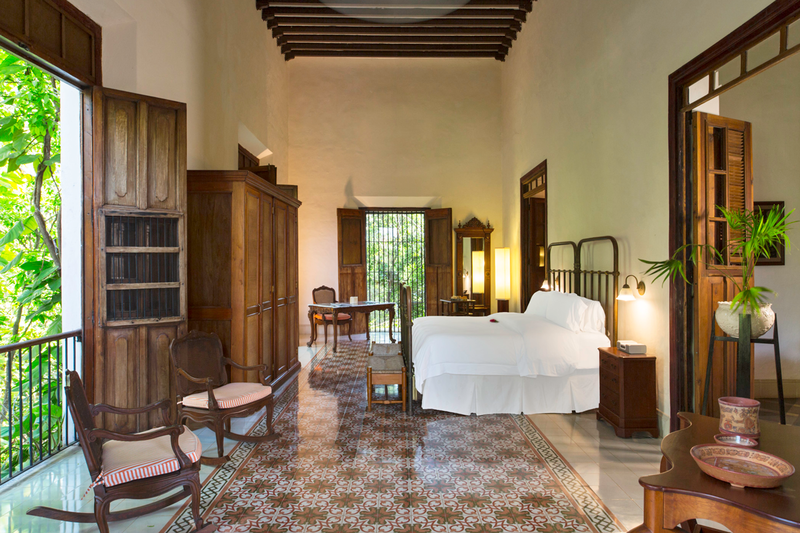 • One Presidential Suite: “Cuarto del Patrón” which literally means the Landord’s room. 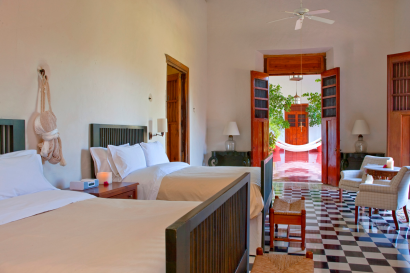 It´s the only room in the main house, it has a private pool and terrace along with all special amenities listed below. 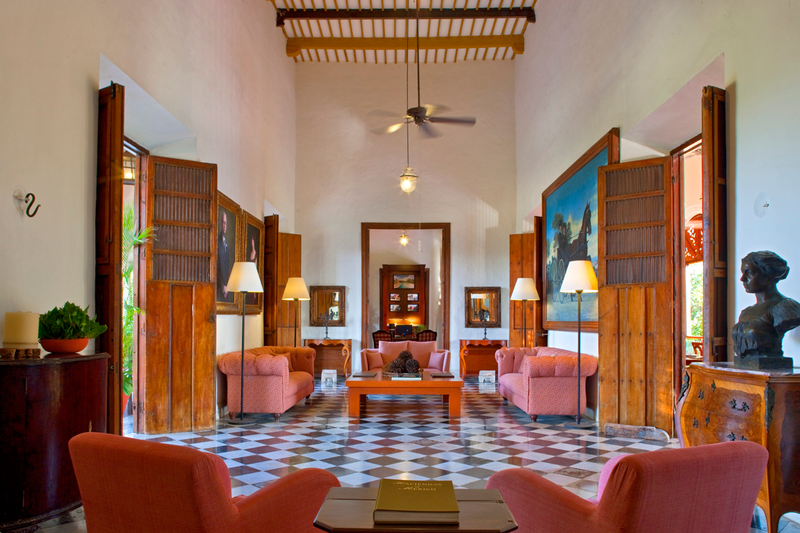 • Five Deluxe rooms (70 m2) Rooms are located near the main building of the Hacienda; they are very spacious and have a lounge area. Some have bathtubs, an outdoor tub and a terrace with a garden view. 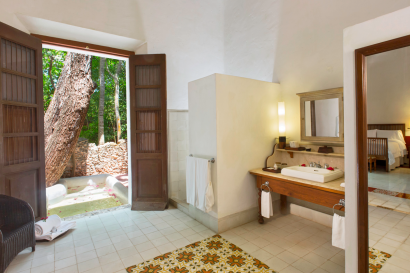 • Eleven Junior Suites (55 m2) Rooms are located near the main building of the Hacienda; they have one bedroom, bathtubs, a special outdoor tub which overlooks the garden. 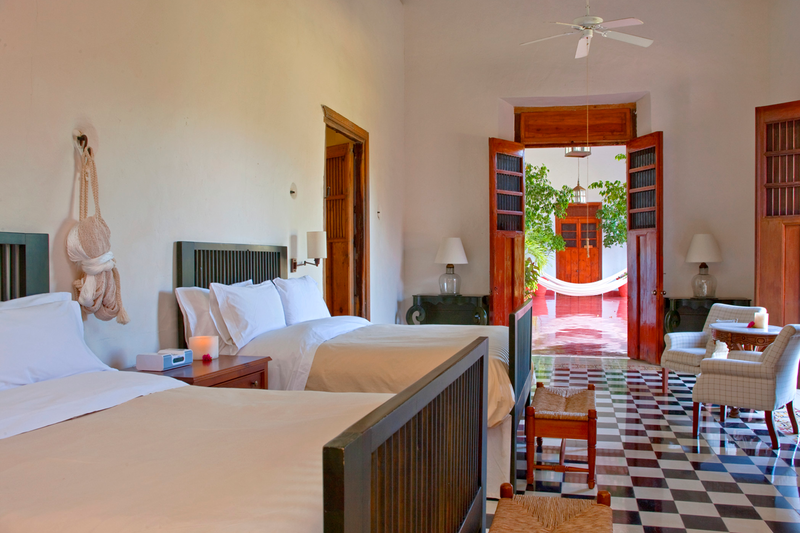 • Eleven Superior Room (45 m2) Rooms are located at the entrance of the Hacienda; they are cabin style and share a patio and a central garden. Located in the main house, overlooking the breathtaking main gardens, swimming pool and the old factory buildings. 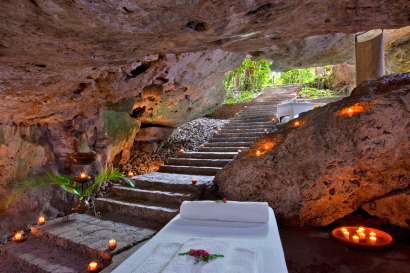 It serves a blend of regional and international cuisine; authentic procedures such as the “pib” (underground oven) are incorporated in the menu. Most of the ingredients are organic and come from the gardens. 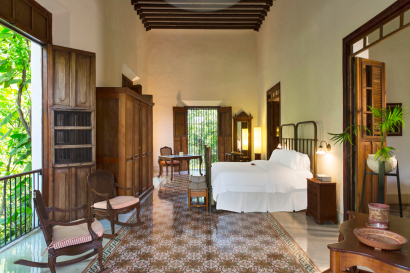 The Haciendas together with the Fundacion Haciendas del Mundo Maya have worked to recover ancient Mayan healing practices; we have identified community members with expert knowledge in traditional therapeutic massages and we have invited them to practice these ancestral therapies with us. Through their training we have further enriched their knowledge of healing massages and other Spa techniques. Working together with the community provides them with new development opportunities and fields of work. 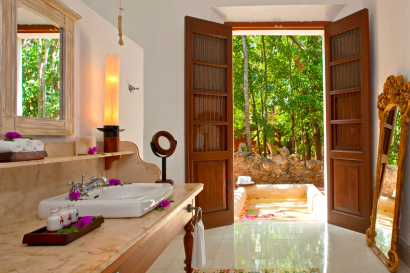 As a result of this collaboration, the Haciendas have the exclusive Hol-Be Spas where unique therapeutic practices are offered in each Hacienda. All activities must be programed in advance. One of its most representative dishes in Yucatan is the cochinita pibil: A typical platter of the region which consists of pork meat flavored in achiote and sour orange, covered by banana leaves and cooked in an underground built oven. Guests at the Haciendas a Luxury Collection Hotel have the opportunity to witness the “Cochinita Pibil cooking show”, where they share the experience cooking hand in hand with the chef, and then enjoy this delicious dish served with marinated onion in handmade tortillas. 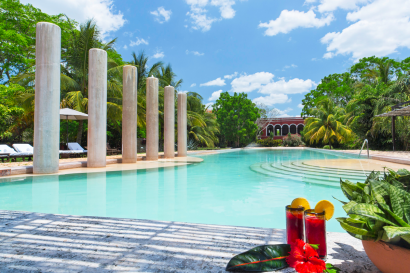 Located within the grounds of The Hacienda Temozon a Luxury Collection Hotel, Xaca Mucuy is an open cenote almost circular with a diameter of 20 meters, where visitors can immerse themselves in the depth of its waters ranging from two to almost 35 meters. The experience of our cenote begins long before you reach it, as the transfer to this Maya oasis takes place in the “Truck” pulled by “Tabaco” the donkey. Our specially trained gardeners offer a tour for bird watching to our guests, which is complemented by a book on all the local birds. Inside the Cenote Xaca – Mucuy, guests can embody spiritual teaching and experience the subtle forces of the site guided by our Chaman.